Real Madrid is one of several major clubs (hello Chelsea) who publish a gushing press release summarising their financial results several weeks ahead of the full figures. This year's summary came out on 16th September, ahead of RM's AGM on 25th September. This post takes a look at what the figures say and makes a comparison with Manchester United (the only other major club to report 2010/11 figures so far). Despite finishing second in La Liga to Barcelona for the third successive season, 2010/11 was a better season for RM than 2009/10. The club won silverware in the Copa del Rey and perhaps more importantly made it beyond the first knock-out round of the Champions League for the first time since 2003/04 (even if it was FCB that knocked them out in the semi-final). The better on-pitch performance was the major factor behind the 8.6% (€37.9m) increase in revenue to €480.2m (£411m). The new three year Champions League TV deal and the club's progress to the semis increased RM's CL income from €26.8m in 2009/10 to €39.3m in 2010/11. The two cup runs meant Real Madrid played 29 home games in total, compared to 24 the previous season and this will largely account for the rest of the revenue increase. No split between Matchday, Media and Commercial revenues is given in the press statement. The 2010/11 season saw the start of the Mourinho era at the Bernebeu and with him came significant transfer spending and a large hike in the wage bill. Despite the increase in income, the ratio of wages to turnover increased to 45% from 43.5%, although this is still a very healthy performance compared to other clubs (FCB reported a ratio of 67% in 2009/10, Chelsea 84% and City 107%). We can use the reported ratio to separately identify staff and non staff costs. Despite the departure of club legend Raul as well as Guti, Diarra, van der Vaart and others, the arrival of Carvalho, Di Maria, Ozil, Khedira etc as well as Mourinho himself meant the wage bill rose a very punchy 12.4% year on year. It is reasonable to assume there was an increase in bonuses during the season to match the better playing performance. 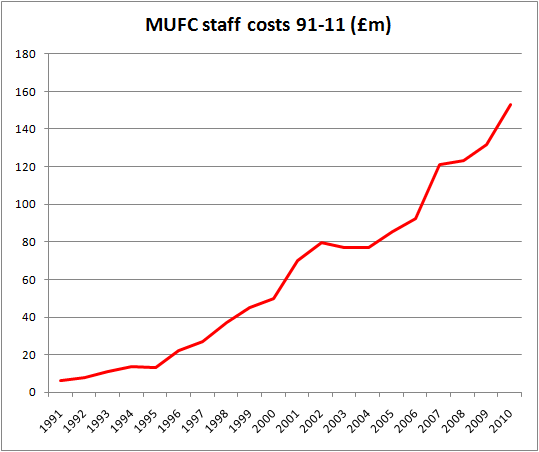 With staff costs rising sharply, the club did very well to maintain virtually flat operating expenses (before depreciation and amortisation). With total costs only rising 0.5%, non-staff expenses must have fallen 15.9% year on year. This cost line has proved volatile in past years (non-staff expenses fell 12.7% in 2007/08 and then rebounded 24% in 2008/09) but this is still a very commendable performance. It appears Real Madrid have found significant economies at the club which has allowed them to spend more on the playing side. With revenue up 8.6% and total operating expenses only up 0.5%, EBITDA (ex-player sales) rose very sharply in 2010/11, up almost a third to €147.7m. 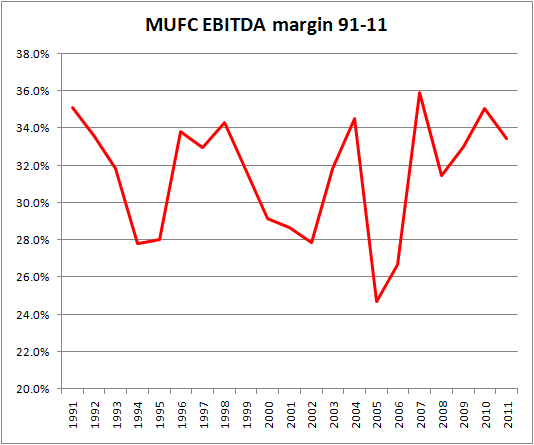 The EBITDA margin was a healthy 30.8%, a huge improvement on 2009/10's 25.2% and almost double the 16.9% the club made in 2004/05. With only van der Vaart commanding any sort of proper sale fee, the club's "profit on player" sales (transfer proceeds compared to a player's book value) was sharply lower at €3.4m vs. €34.0m, leaving total EBITDA up 3.8% at €151.1m. Profit on player sales is a volatile figure for any club and I would not include it in any measures of fundamental profitability. 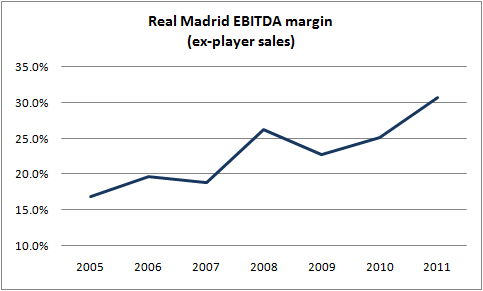 Between the €151.1m of EBITDA including player sales and Real Madrid's reported operating profit of €46.5m are charges for depreciation and player contract amortisation. Unhelpfully the club did not split out the two categories but depreciation is likely to be a very small element (Barcelona's depreciation charge in 2009/10 was only €8.1m for example). Player contract amortisation is how transfer spending is reflected in football club accounts. The value a club pays for the contract of a player is "amortised" or charged over the length of the contract. The implied depreciation and amortisation charge for 2010/11 is €104.6m, up slightly from €101.7m in the previous year. This movement reflects around €50m of transfer spending (which assuming the new players were on five year contracts would add c. €10m to amortisation) less the sales of Diarra (whose original €26m cost was amortising at c. €5.2m pa) and van der Vaart (his €13m cost was amortising at c. €2.6m pa). Real Madrid's amortisation charge is the highest in world football, reflecting years of big name signings at record breaking prices. The Real Madrid press release trumpets a 30.6% fall in debt to €169.7m from €244.6m the previous year. The club's own definition of debt is very wide, including football creditors and stadium debt. There is no breakdown of bank debt, transfer fees due and other creditors in the release. 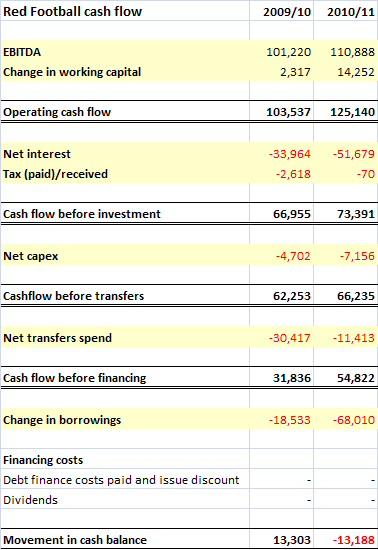 The €75m fall in debt looks entirely consistent with EBITDA (ex-profit on player sales) of €148m, net (cash) transfers of c. €40m, interest of around €10m (my estimate based on lower average debt and the interest paid in 2009/10), tax and capex. 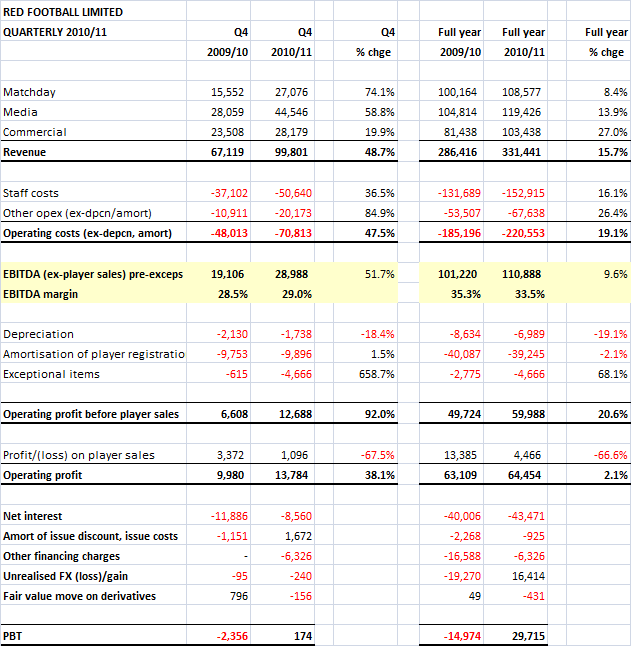 The Real Madrid balance sheet is pretty strong and at only 1.1x EBITDA debt is not a major concern for the club. Manchester United is the only other major European club to have published 2010/11 results so far. 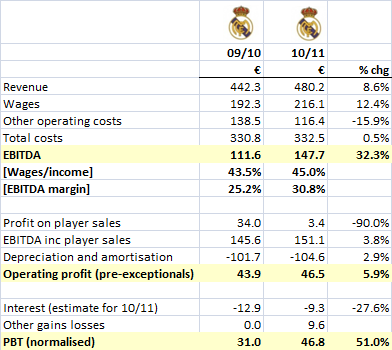 I have converted the Real Madrid figures to £ (at the average rate between 1st July 2010 and 30th June 2011 of €1 = 85.65p). Real Madrid's turnover continues to exceed United's, but the gap closed in the last twelve months as United reached the CL final and saw very strong growth on the commercial side. Both clubs have seen an enormous increase in income over the last five years, but the very significant price increases at United mean it has grown revenue faster (+13.9% CAGR 2006-2011 vs. 10.4% CAGR at Real). c) The hugely unbalanced La Liga TV deal which brings FCB and Real Madrid around £110m each per annum (vs. the £60m United earned from the Premier League). In addition to these factors, Real Madrid has for many years been one of the most effective drivers of commercial income in football earning over £116m from this source in 2009/10. The two clubs have virtually identical wages/income ratios (45% for RM and 46.1% for MUFC). With Real's higher income base this means the Spanish club spend £33m more than United on wages. It should be noted however that the Real figure include around £20m for the club's basketball team and that the United number includes bonuses for winning the league and reaching the Champions League final (which RM did not of course have to pay) of £9.7m. 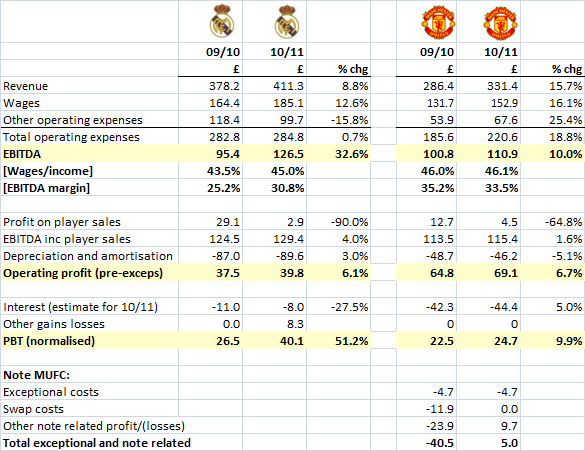 Taking these into account, we can see that Real spend around 15% more than United on "normal" football wages. United's other operating expenses are significantly lower than Real's, but the two numbers are converging rapidly. United has long had higher margins than Real due to lower wage costs, but the gap is now as close as it has been in recent years at only 2.7%. 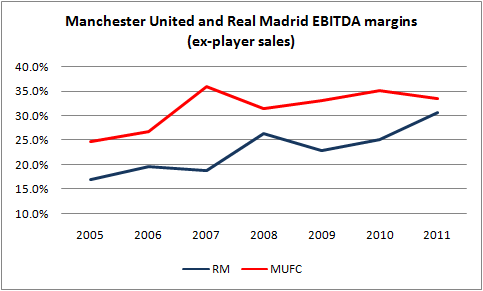 It is after the EBITDA line that the major differences between the two club's business models is evident. United's depreciation and amortisation charges are almost half Real Madrid's reflecting the far lower reliance on expensive transfers at United in the last five years. Of the eighteen players who appeared more than 20 times for Real Madrid in 2010/11, only one (Casillas) came through the club's youth system, one was a loanee (Adebayor) and sixteen were players bought in at an average cost of £19m per player. By contrast at United, there were also 18 players who made more than 20 appearances last season but four were youth products and those who were not cost an average of only £12m each. The money saved by United on transfers goes on interest. Real Madrid reported an interest charge of £11m in 2009/10 and I estimate it will have fallen (as the debt has fallen) to around £8m in 2010/11. At United of course, interest on the bonds soaks up around £44m per annum, purely for the honour of being owned by the Glazer family. In previous years the Glazer's financial structure has involved other major costs for United. In 2009/10, swap losses, FX losses and other charges cost an additional £40m. In 2010/11 there was a small net gain of £5m on such items. Putting the two clubs side by side, we can see two very profitable football clubs putting their resources to very different uses. Neither will struggle under the new Financial Fair Play regulations. United's Q4 and full year 2010/11 results published today reflect a great season on the pitch that was almost as good as it gets. The financial impact of the 19th title and reaching the Champions League final were significant on both the revenue and the cost lines. The EBITDA performance was exactly in line with my forecast in my post of 17th August, United remains a predictable money machine. The interest bill remains very high (£51.7m in cash in 2010/11), and the year can be characterised as one where operating profits were largely used to reduce debt rather than invest in the club. Bond buybacks accounted for c. £64m, whilst net transfers only cost £11.4m. The cost of De Gea, Young and Jones will fall into the current financial year. United played 29 home games in 2010/11 vs.28 the previous year and also benefited from a share of gate receipts for the two trips to Wembley. The extra games and gate sharing added c. 5.7% to matchday income with a strong US tour and better corporate hospitality sales adding c 2.7% to leave total matchday income up 8.4%. This is a really as good as it gets for matchday income with virtually the maximum number of games played at 99% of capacity crowds. There was no price increase put through in 2010/11 (excluding the VAT rise). Media income rose £15m or 13.9% on the previous year. Premier League income rose £7.4m, largely from the overseas rights deal (shared equally by all PL clubs). Champions League income rose c. £5.5m due to the club reaching the Champions League final rather than quarter final (offset by a smaller "market pool" payment). The balance came from better domestic cup runs and MUTV. As with matchday, on current deals this is close to the maximum United can expect to earn from media. The extra earned from winning the Champions League would be c. £3.2m and the extra "market pool" payment for coming first in the PL is worth c. £3.6m. This is of course the key growth area for the club. The 2010/11 results saw Commercial income rise 27% or £22m on the previous year. This was driven by the Aon deal (adding c. £6m pa), the contracted step-up in Nike income (adding c. £2.1m pa) and the raft of secondary sponsors (Conchay Y Toro, EPSON, Singha, DHL etc). Nike and Aon now account for 47.4% of Commercial income, with the majority now coming from the secondary partners. These figures pre-date the £10m pa DHL training kit deal and Mister Potato(!). The club remain as bullish as ever on the scale of the Commercial opportunity, with significant costs being added in the new (Stratton Street) London office. The expectation being pushed to the media by the club is a doubling of the Nike and Aon deals when they are renewed in the next two to three years. Add DHL and further secondary partner growth and a 2015 Commercial income number of c. £190m looks achievable. The price of success on the pitch can be seen in the sharp rise in costs during 2010/11. Staff costs rose £21.2m or 16.1% to £153m. The club splits this increase between additional bonus payments of £9.7m and "normal" increases of £11.5m. So the "normal" inflation in wages was around 8.7%. Other operating costs increased at an even faster rate than the wage bill, rising 26.4% year on year or £14m. Around £2.3m of this increase relates to higher pre-season tour costs and the costs of taking the club and its sponsors to Wembley for the Champions League final. The rest is largely related to continued spending on the club's commercial operations, on MUTV and on charitable donations to the Foundation (we will have to wait for the report and accounts for that number). With revenue up 15.7% and costs up 19.1%, EBITDA rose 9.6% to £110.9m, a margin of 33.5%. Although the margin was down 1.8% on 2009/10, it remains well within the normal range seen since 1991. The club has moved from UK GAAP to IFRS, eliminating the goodwill amortisation charge. The player amortisation charge was down 2% (reflecting a quiet year for transfers). Depreciation fell sharply (no explanation given). There was a £4.7m exceptional charge largely related to a bad lease in Ireland. With EBITDA of over £110m and a positive working capital movement of £14.3m (pre-payments), operating cash flow was again very strong at £125.1m (up from £103.5m). The major cash outflow was of course interest of £51.7m which must include some residual swap loss payments as flagged in the bond prospectus (although they are not identified separately). Cash flow after interest and tax was c. £74m and the club chose to use the majority of this to reduce debt, buying back c. £64m (face value) of bonds and making its small regular payment on the Alderley property loan. 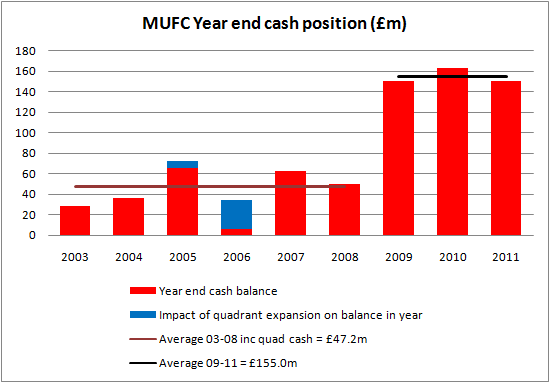 Investment in the squad (£11.4m) was low compared to recent years and infrastructure spending (£7.2m) was in-line with recent years. As stated above, the summer spending on De Gea, Young and Jones falls into the current year's accounts. Taking all these items into account, the club's year end cash balance fell slightly to £150.6m, very much in line with the average year end balance (£155m) since the sale of Ronaldo. Around £45m will have been spent since the year end on new players, and a bond coupon payment of c. £20m was made on 1st August. The club therefore has a current balance of around £85-90m. These are very strong operating results, but then they "should" be given the success of Fergie and his players on the pitch. Seasons don't get much better than 2009/10 and therefore the Matchday and Media income streams are very close to being as good as they can be. The performance of the commercial operations remains excellent, although the thing that really shows how strong they are is the DHL training kit deal which doesn't even appear in these figures. The club thus remains a prodigious cash machine attached to a lot of debt. The £51.7m spent on interest takes the total spent on interest and fees since 2005 to £373m. Another £105m has been spent repaying debts taken on by the Glazers. The total of £478m is equivalent to 67% of the money spent on wages since the takeover or more than 7.5x the net transfer spend of the club. It is hard to pronounce on the future until we know more about the proposed IPO. 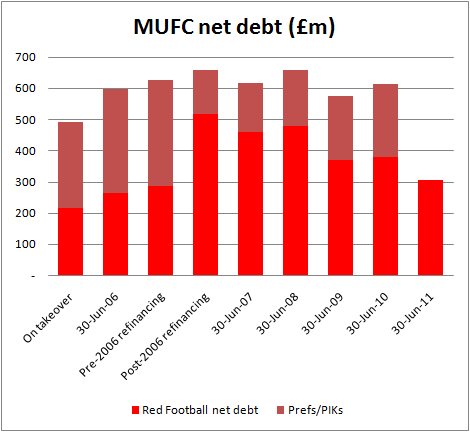 At the moment, surplus cash is being used to repay debt, a prudent waste of our club's money.... With net debt (at 30th June) down close to £300m, a debt free club is not unimaginable. That would be a huge improvement on the position in early 2010, but would have come at the cost of almost half a billion pounds of unasked for expense over the last five years. You can read the results and see the club's presentation to investors here.